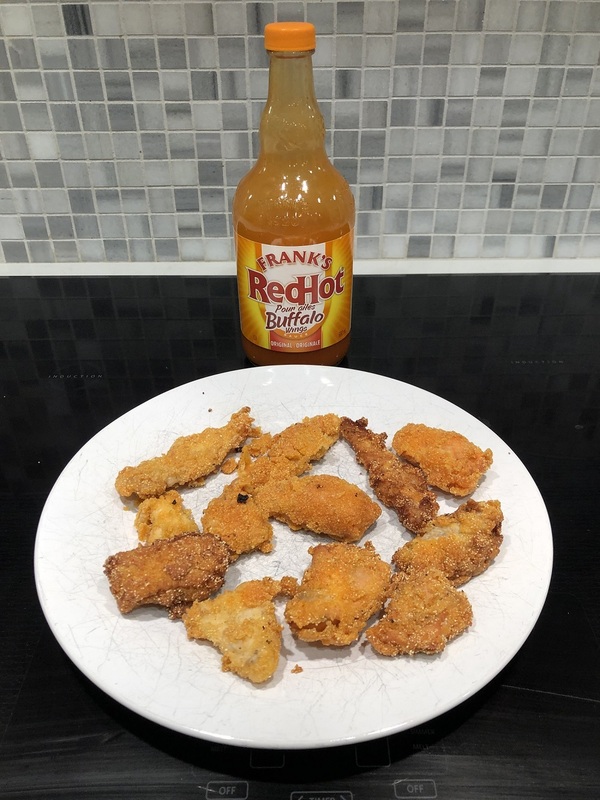 There’s a been a popular deep fried fish recipe flying around the inter-webs lately it’s called the “Franks Red Hot Breaded Fish Recipe”. Typically I’ve seen it used on white fleshed freshwater fish like Walleye, Crappie, white bass, etc. 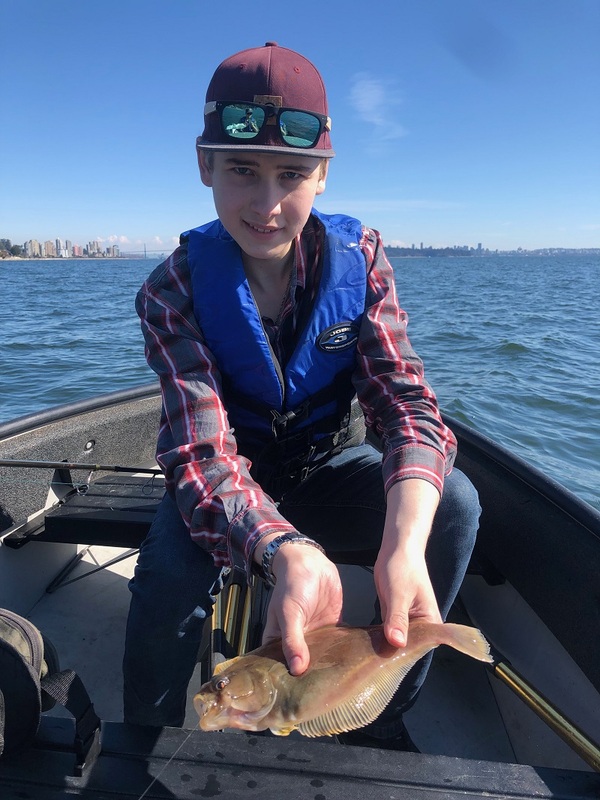 I wanted to try the recipe with some local fish up here in the NW, so I went out into Burrard Inlet with my 2nd cousin and caught a bunch of English Sole and Starry Flounder to try it on. And to add a wildcard, I tried it on some Salmon I caught last Fall as well. Here is the recipe and the taste results!! Franks Buffalo Wings Sauce (12 oz or 350 ml). You can use any flavour of Franks you prefer. Fish (approx. 1-2 lbs). These measurements above can be smaller or larger depending on how much fish you have. 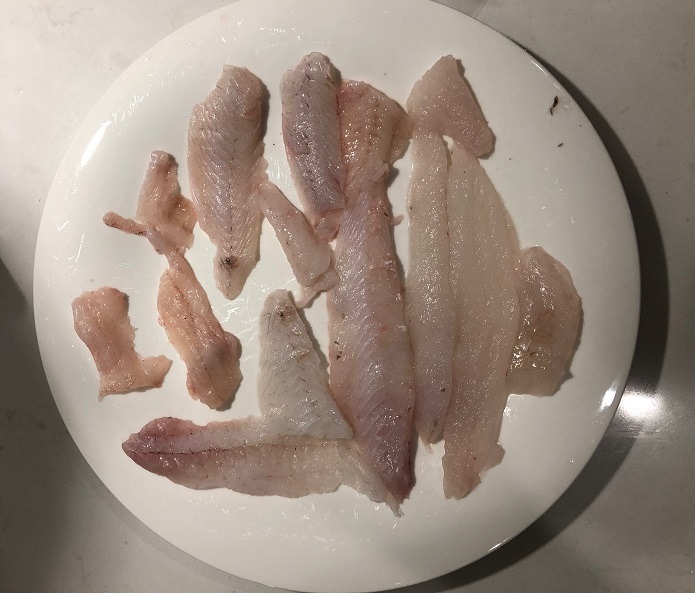 Step 1 – Cut up fish into 2-3 bite size pieces. Think of McDonald nugget size or your favorite fish strips sizes. Step 2 – Pat dry the meat with a paper towel. 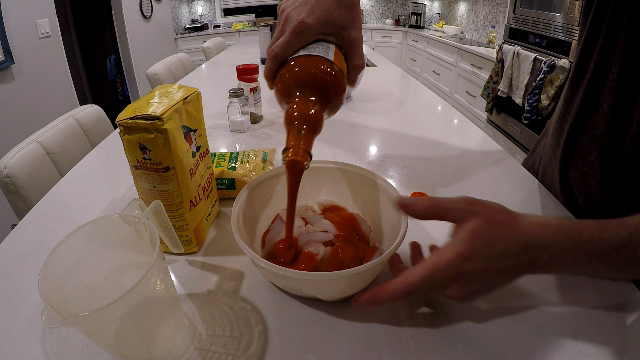 Step 3 – Place pieces of fish into a large bowl and coat all the meat in Franks Sauce. Mix the sauce and meat around to ensure all the fish is covered. Frank’s Flavour preference? I like the Buffalo Wings flavour of Franks but you can use the original or whatever style of Franks you prefer. Step 4 – Mix up breading mix by adding the Flour, Cornmeal, Salt & Pepper into a large bowl or tray (see amounts in ingredients section above). A long rectangle tray will make it easier to bread the fish vs. a bowl. Step 5 – Add the vegetable oil to a saucer pan and heat up to 300-350 degrees (if the oil is smoking it’s too hot!). You can use whatever oil you prefer with your fish, e.g. Avocado, Canola, etc. 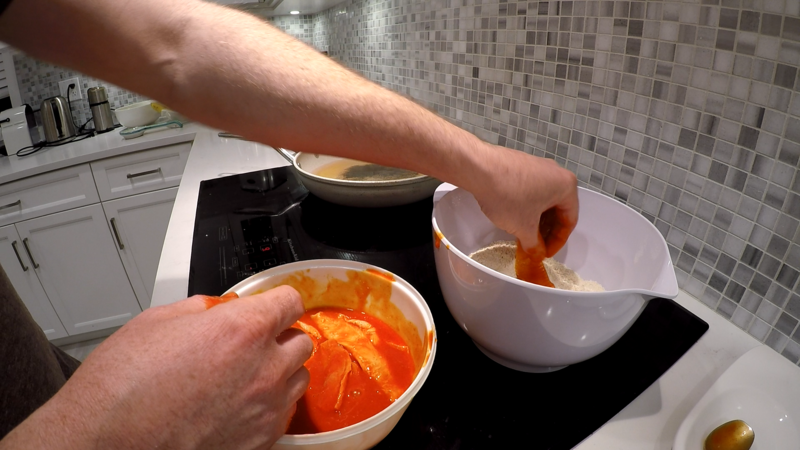 Step 6 – Take the marinaded fish strips and put them into the breading. Ensure the pieces are completely covered. 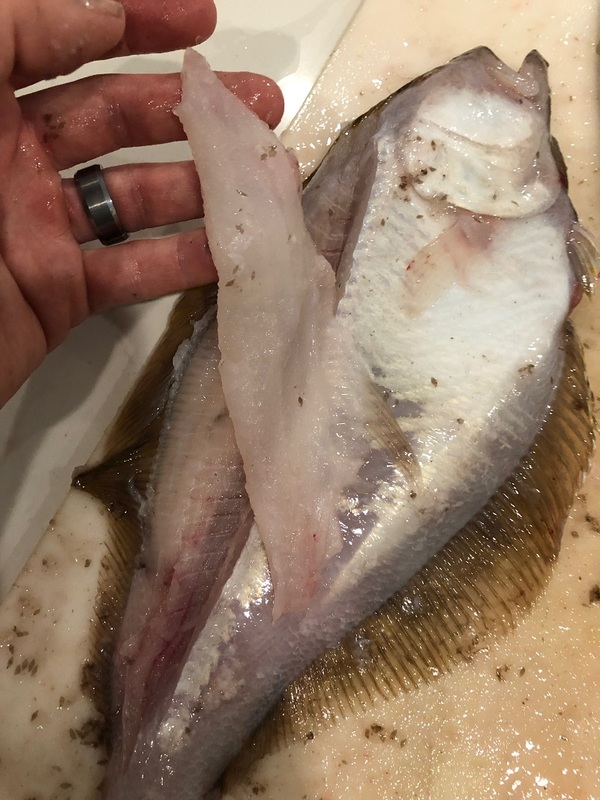 When breading and handling the fish I recommend using tongs vs. hands this will help reduce clumps with the marinade and breading. 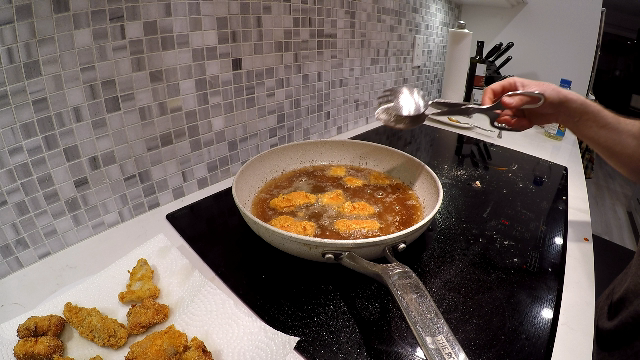 Step 7 – Place one piece of fish into the oil. If you’re getting some smoke from the first strip turn down the oil and wait a few minutes before continuing to add the rest of the fish. Otherwise, continue to add the strips. Step 8 – Cooking time is subjective to the size/thickness of your fish strips. If you are using a deep fryer the strips will begin to float so you know they’re ready. If you’re frying them in a pan leave them until they’re golden brown. Step 9 – Remove from the oil and place on a plate with paper towel to remove any excess oil and let them cool down for 5 minutes. Step 10 – Enjoy! Feel free to dip in ranch, more hot sauce or your favorite dip! That said, you MUST try them with no dip as they’re excellent all on their own. Cheers! 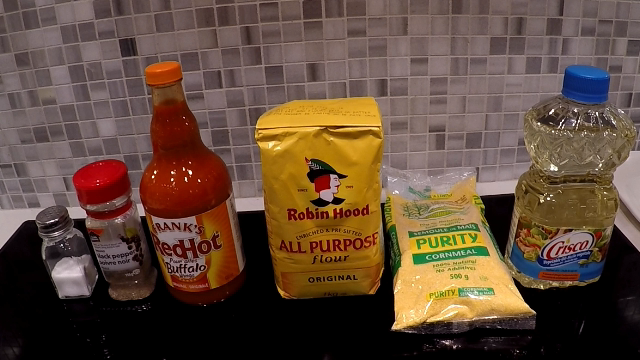 How to make deep fried Sole, Flounder and Salmon with Franks Buffalo Sauce. 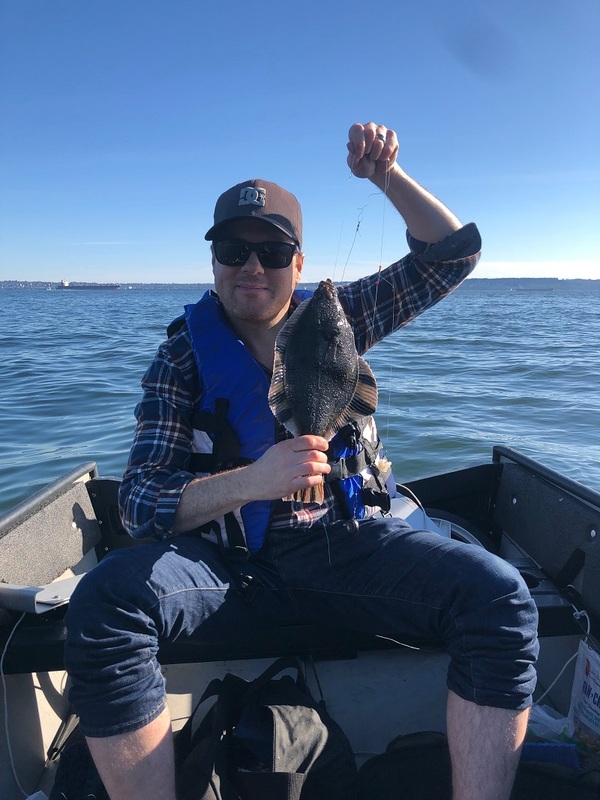 I have a 12′ Porta-Bote with an electric motor which I took out to do some ground fishing for Sole, Flounder and anything else that would bite. We got out a little later than we wanted as we started fishing just after slack tide and it was on the drop. Typically, I like to fish an incoming tide (usually 2 hours before high tide). 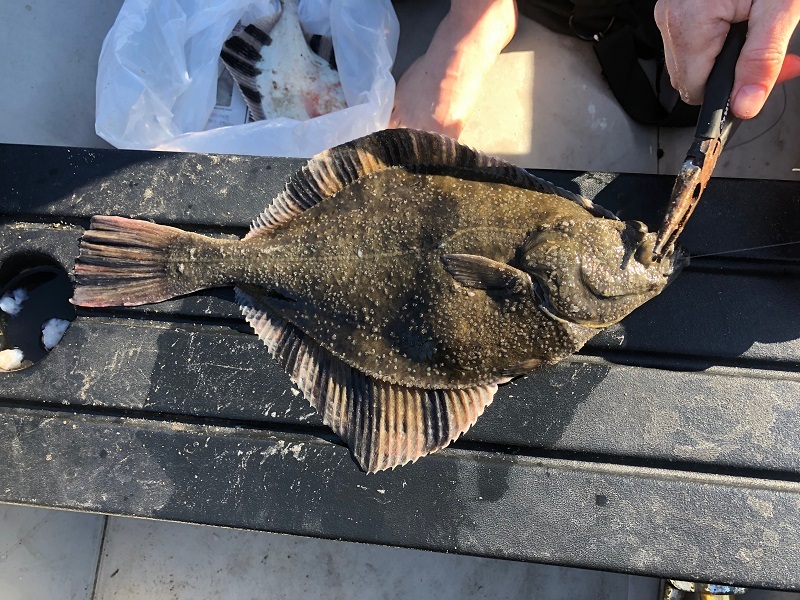 Regardless of our timing we got into half a dozen Sole & Flounder in a 2 hours of fishing. We got into these fish using a bottom fishing setup with small pieces of uncooked prawns. See the diagram for my favorite (and very popular) setup to fish from the pier, beach, in a anchored (or slow drifting) boat. The tackle details I was using was a spinning rod and reel, you can get away with light reels/rods for these fish. However, if you run into a Dogfish you’ll definitely put them to the test! I use 30# Powerpro Braid on my reel as the mainline. I connect the mainline to my leader and weight lines via a 3-way swivel. You can also use a Pickerel rig if you prefer, which is like a glorified 3-way swivel. The leader line I like is 12 lb Fluorocarbon Blue Label line from Seaguar. I tie on a size 1 Octopus hook and add a chunks of raw prawn. The other line I use is for my weight, for that I recommend a cheap mono line around the 8# mark. This weight line must be a lower rated than the leader line in case you get snagged on the bottom (aka. less than 12# or whatever your leader line strength is). The reason for this difference in lines is if you get hung up on the bottom you should only break off on the cheaper/weaker weight line (so you don’t loose the most important terminal gear). Also very important ensure the weight line is longer than the leader line, this will ensure your bait is not sitting on the bottom. Your weight should be on (or just above) the bottom to ensure your bait is in the target zone for these bottom feeders. For the weight itself, I like to use around 1.5 oz – 3 oz, depending on the tide current. If the current is ripping you’ll need a lot more weight. On this particular date we were using 2 oz weights.